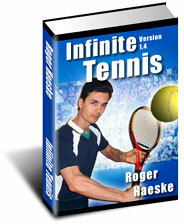 Click the title below or the book cover to learn more about, Infinite Tennis. "Unlock and Unleash your Hidden Potential to Play Your Best Tennis Ever!" Do you struggle to master the mechanics of your backhand or any other shot? In many instances, mechanics can be learned much more easily by focusing on your goal and not on the actual mechanics or HOW to hit the shot. Mechanics, "of course" are what make that goal possible, but focusing on mechanics can at times be a very slow, frustrating and boring way to learn. In fact I learned most of my mechanics by focusing on the goal, since I didn't have any kind of formal tennis instruction until I got into college. In fact my tennis students often ask me how I move my arm or body to hit a shot and there are many times when I quite frankly don't know. I have to stop and analyze my shot in slow motion. It's only then that I realize how I actually hit my shot. This proves that you don't have to know mechanics to use mechanics. A similar analogy is this; you don't have to know the way electricity works to use a light bulb. You only have to know how to flip on the switch; you don't need a degree in electronics to do that. What I am trying to say is that sometimes knowing mechanics or focusing on the mechanics will not necessarily help you learn the shot any faster. In fact it could really slow you down and in extreme cases you could get injured. Early on in my tennis-teaching career I was teaching a student how to do his footwork better. I told him to take his steps in a certain way. He had to do this while trying to hit the ball as well. I could see he was getting very frustrated. This unnatural focus became so difficult for him that he actually tripped over his own feet, fell on his mouth and cracked a tooth in half. It was very unnatural and uncomfortable learning situations with my students and myself that made me search for better and easier ways to learn mechanics. Now when it comes to teaching footwork and all the other strokes I use different methods. For one thing I simply try to get the student more aware of their footwork. However instead of focusing on the feet I have them learn about the ideal hitting position. This is the position relative to your body that you would most want to hit the tennis ball from. Then the student simply needs to become aware of whether or not she felt she hit a particular shot from the ideal hitting position or not. This way the student is not focused on her feet. Basically if she is balanced and in the ideal hitting position then she naturally had to have good footwork. Continued focus and awareness on this principle will naturally help you develop great footwork without any strain to learn. The simpler way is to not focus on the feet but to instead simply lean forward into your shots. This is a much easier way to get you to step into your shots. Thinking about your feet while trying to hit a tennis ball is very difficult and leads to unnatural shot making. Another way to easily learn mechanics is to simply picture yourself hitting the ultimate topspin backhand. In your imagination see yourself hitting this shot with power, accuracy and a lot of spin. To help you with your visualizations it is very helpful to watch players who already can hit the shot you are trying to hit. Go watch a pro match on TV or in person. Or go to watch an open tennis tournament or find some local players who are really good and just watch their games. I once watched a match between to guys who had very good slice backhands. Up until that point I never was able to hit a good slice backhand. But after watching that match I somehow absorbed that backhand. I just knew how to do it but I wasn't really sure of the mechanics. By watching them I actually got the feeling of a slice shot. I remember another time when I actually received a picture in my mind for a certain martial arts spinning kick. All I did was follow my internal image and I completed the kick exactly like my internal image. It was great on my first try. So sometimes an image will come up out of the blue and be helpful to you. When you focus on a certain goal your subconscious will help you come up with answers to help you achieve your goal. Dan Millman who became a world champion in the trampoline and later a famous author of the "Peaceful Warrior," series of books, used this technique as well. Dan would practice his gymnastic and tumbling moves in his imagination before he ever tried them physically. Many times he was successful on the first try because he had spent prior time visualizing the move. His teammates were amazed at how he could so easily execute all these new moves. Imagining something as so, makes it so. Another tool to use is Experimentation. Even if you don't live up to your internal image right away just keep on experimenting. It is perfectly fine to make mistakes, just don't make the same mistakes over and over again. Use the overcompensation principle I have discussed before. If you are not getting enough topspin then focus on hitting an exaggerated amount of spin. Or if your balls tend to go into the net a lot then aim your balls to go over the net by at least 5 feet the next time you hit. Then you can gradually work your way down to finding the middle. You can learn many things by experimentation. I learned how to develop a tremendous power serve with experimentation. I didn't have any instruction whatsoever. I just kept on experimenting with techniques until I found things that worked. The key was that I had a very strong desire to develop a powerful serve. I also had natural talent in this area of my game but I still had to work at it to achieve my goal. Over the years I've developed many more techniques that make learning mechanics a simple and fun process. I have all sorts of techniques for the serve, volley, backhand, forehand and overheads. Take some lessons with me and you can save yourself lots of frustration and time to help you learn these shots easily. The weather is good again and so I am doing outdoor tennis lessons now. I do lessons at courts in East Brunswick and at South River High School. For more info on taking private or semi private tennis lessons with me just go to this link on my website http://supertennis.net/TennisLssns.htm. Send mail to rh(at)SuperTennis.net with questions or comments about this web site. To email me, just replace the (at) with the @ sign in my email address above. I have to do this to prevent being spammed by automated email address collecting programs.